It's not entirely clear why The Education of Charlie Banks takes place in late '70s/early '80s New York but my guess is that it's the time period in which either writer Peter Elkoff or director Fred Durst (of Limp Bizkit fame) came of age, and therefore felt compelled to nostalgically portray. It worked for me better in The Wackness but maybe that's just because I grew up in the '90s. Charlie Banks seems like it could be taking place at any point in the past or future. Charlie (Jesse Eisenberg, who's brilliant in films like The Squid and the Whale and is kind of too good for this movie) is a super-awkward middleclass teen who's on the Ivy League path. He yearns for acceptance and gets it when he's invited to hang with a bunch of trust fund clichés at university. It all seems to be going okay for Charlie at university until former rival and bully Mick (Jason Ritter) shows up at his dorm. The film establishes the blue-collar/upper crust conflict at the outset, when ten-year-old Charlie and his best pal Danny (played in the college years by Christopher Marquette) first confront Mick as a playground bully. Fast forward to their teen years and Charlie witnesses Mick brutally beating up some kids at a party. When we get to the Ivy League years, Mick's been clearly established as Charlie's personal demon and Charlie is understandably worried that his appearance at the dorm is going to steal his girl (the uncharismatic but striking Eva Amurri) and make his fragile world come crashing down. 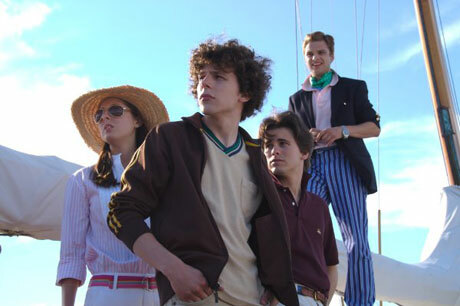 This coming-of-age drama about class conflict and facing one's fears on the path to adulthood has some potential but it comes across like a ham-fisted Great Gatsby with a really mean version of Barbarino from Welcome Back Kotter thrown in to make Gatsby's dreams of upward mobility seem more ludicrous.